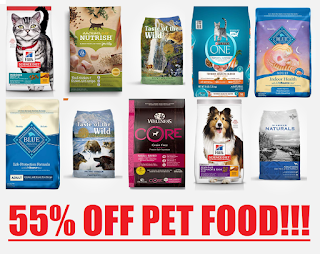 SUPER HOT 55% to 65% off Dog Food and Cat Food on Amazon + Free Shipping!! Purina, Hill's Science, Blue Buffalo, Taste of Wild, Iams, Friskies and Many more! !There are a a bunch of different Dog and Cat Foods that have 50% or 40% off coupons right now + an extra 5% or 15% off with Subscribe & Save and Free Shipping. Works out to huge savings and an AMAZING DEAL!!! Most food DO have coupons but not all. If you choose something and you don't see the 40% of 50% off coupon under the price then choose something else. Choose something that is higher priced so you take advantage of this coupon. Can only get one order per account.